From the Daytona 500 to the season finale championship race in Homestead, NASCAR fans can know that BetStars has you covered with in-depth data for America’s #1 auto racing series. Our team of writers will examine the odds on not only which driver will capture the checked flag first, but who also will take the fastest lap and which drivers are likely to have the dreaded DNF. 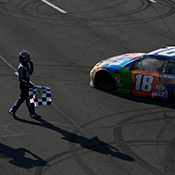 So ladies and gentlemen, start your betting engines with our NASCAR coverage at BetStars. It's almost playoff time in the NASCAR Monster Energy Cup series. And after another exciting regular season of driving, the top drivers will contend for the sport's biggest prize again in the final 10 races of the season.